Californian landlords have the right to evict the tenants who do not abide by the terms of the lease agreement. If their violations are indeed valid, you can immediately start the proceedings by first warning, and then evicting the tenant if they do not pay attention to your warning. While evicting tenants in California can be a daunting process, you must follow the right legal procedure to protect yourself from the legal hassles that can last for months and lose valuable rental income. Before you even think about going to court, it is important to ensure that the violations committed by your tenant are actual grounds for vacating the property under the Californian Eviction Law. 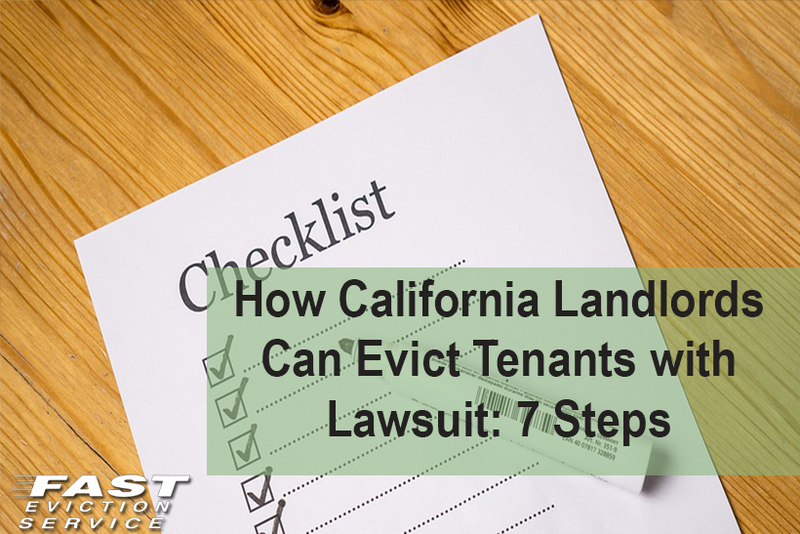 Not paying monthly rent, breaking the terms of the rental or lease agreement, damaging the property, disturbing the neighbors, and using the property illegally are some of the valid grounds for eviction under California Law. While landlords should always try to resolve the problem without going to court by getting in touch with the tenant, meeting them personally and discussing the matter and giving them a violation notice, often taking the matters to court is the final only option. It is crucially important to follow the correct legal steps to evict a tenant in California to have your eviction action upheld in court. When you have already given several warnings to the tenant, you can then go ahead with filing a lawsuit for evicting the tenant. This filing of an eviction lawsuit against tenants in California is known as the “Unlawful Detainer Complaint”. You can open this lawsuit by filing the Complaint form at the courthouse. Once the Complaint form is successfully filed, a Summon will be issued to the tenant and they will be required to respond in 5 days. A court will provide the tenant with a 5-day notice to vacate the property. Remember that the tenant also has the right to respond to this notice which will often take the form of an attack on the service method or notice sufficiency. Moreover, they can also respond to the complaint’s substance. When the notice period of 5 days is over, the landlord can request the court to provide them a court date. One can contact the clerk of the court to get a date. The court date is generally set from about 2-3 weeks from the date when you asked for the date. The landlord cannot collect rent during this period; however, you’ll be paid the same amount by the tenant when you win the case. When the date comes, ensure that you carry records of the violation by the tenant and any notice that you may have served to the tenant before taking the eviction case to the court. Also, carry a copy of the tenant rental agreement or lease which is signed by both of the parties. Generally, eviction proceedings take an hour or so. But it can take longer on the basis of the defense mounted by defendant. Apart from the documents mentioned above, you might be required to carry additional documents too. Court matters can be time-consuming and complicated. Thus, it is highly recommended that you should think about hiring a landlord eviction lawyer to represent you in a California Eviction case. And if hiring a lawyer is not possible, make sure that you take free advice from the self-help court centers. If the tenant loses the case, the local Sheriff will give them a 5-day notice to the tenant for vacating the property. If the tenant has not yet vacated the property even after the court’s 5-day notice, you have the right to ask the local Sheriff to lock the property. The landlord is required to give the tenant notice that if the property is not picked up within 18 days of mailing this notice for clearing the items from the property it will be sold. If the property is worth less than $700, if it is not claimed with 18 days of a Notice of Right to Reclaim Abandoned Personal Property Valued Less the $700 is deposited in the mail, it may be kept, sold, or destroyed without further notice if they fail to reclaim it. The rules vary between municipalities and you can search online ordinances or take professional help in your specific community. If you are looking to evict a tenant by filing a lawsuit in California, follow the above-mentioned 7 step by step process and your eviction case might come to a fruitful end as early as possible.